Richard R. Gaillardetz holds the Joseph Chair of Catholic Systematic Theology at Boston College. He has published numerous articles and has authored or edited twelve books, including An Unfinished Council: Vatican II, Pope Francis, and the Renewal of Catholicism and Keys to the Council: Unlocking the Teaching of Vatican II (co-authored with Catherine Clifford), both published by Liturgical Press. He is also a contributor to Give Us This Day. Gaillardetz has been a delegate on the US Catholic-Methodist Ecumenical Dialogue and served as president of the Catholic Theological Society of America between 2013 and 2014. "As in the original edition, Professor Gaillardetz provides a powerful antidote to a Catholic version of dogmatic fundamentalism by addressing the origin, development, and context of the church's formulation of its beliefs and the authority by which it teaches them. After an exploration of the nature of authority itself, he carefully distinguishes the basic gradations of authoritative teaching in the church and the important dynamic of the articulation and reception of that teaching. Inspired by Pope Francis' approach to the exercise and structure of authority in the church, the revised version freshly looks at the role of the sensus fidei in a more deliberately synodal church that depends on discernment and dialogue to articulate the faith in the present context." "I will certainly recommend the text for my graduate and undergraduate students of fundamental theology and ecclesiology." "Richard Gaillardetz is the premiere authority on the multiple voices of ecclesial authority. He writes with clarity and grace. His new book with three additional chapters is an expanded version of one published 15 years ago, updated in light of Pope Francis's efforts to reclaim Vatican II's vision. 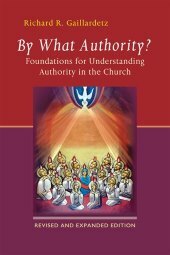 It will be a basic text on authority for graduate students, seminarians, and pastoral ministers." "This new and expanded edition of Richard R. Gaillardetz's invaluable primer By What Authority? displays his characteristic thoroughness and nuanced approach to questions of the interpretation of dogma and doctrine. In particular, Gaillardetz's inclusion of disputed questions in each chapter retrieves ancient Christian methodologies that model constructive dialogue for our increasingly polarized world. Ecclesiologists, historians, and theologians in general will all benefit (as will their students) from this magisterial work." "Richard R. Gaillardetz's By What Authority? is a sound guide and a comprehensive introduction to the complex and often misunderstood world of Catholic belief and teaching. Beginning from a clearheaded discussion of the dynamics of power and authority, it moves from a consideration of Vatican II's personalist, Trinitarian understanding of revelation, to the canonicity, inspiration, and normative role of Scripture; the meaning of tradition; the understanding of `magisterium;' and the various forms for the exercise of the pastoral teaching office by bishops and popes. The strength of his presentation is its description of the interdependence and constant interaction of the pastoral teaching office with the `sense' of all the baptized faithful, including the community of theologians, as the whole church, guided by the Spirit, seeks to discern the meaning and the demands of the gospel. Particularly helpful is the sensible discussion of disagreement in the life of the Church. An excellent resource, this book should be required reading for anyone seeking to understand Catholic tradition and ecclesial life." "The writing style is clear and enjoyable. Any reader who wishes to understand what Catholics believe about Scripture, about teachings of the magisterium, and the forms of authority in the church will find this book to be clear, informative, and enjoyable." "The lucid style makes this book a highly valuable resource not only for theology courses but also for journalists who wish to inform themselves about the Catholic Church, and even for trained theologians who have not had sufficient exposure to fundamental theology or ecclesiology." "Richard Gaillardetz offers a reliable, balanced, and systematic guide to understanding key questions of authority in the Catholic Church. Historically-grounded and pastorally-oriented, By What Authority? demonstrates how the church has often sifted through competing and conflicting interpretations in order to arrive closer to a vision of church ministry and teaching that allows the gospel message to flourish around the world in diverse circumstances. "Of special merit is the Disputed Questions feature that challenges us to wrestle with matters not yet firmly settled. These Disputed Questions invite readers and classroom students into the creative process of discernment, learning, and teaching that must involve all members of the church at every level and in every place." "It is hard to imagine that Gaillardetz could improve on his original masterpiece but he has done just that in this revised and expanded edition of his compelling work. Looking through the lens of scripture, the magisterium, and the sense of the faithful, Gaillardetz offers valuable insight into the many ways that God, `the only ultimate spiritual authority in our lives' chooses to manifest that authority through the sacred and yet quite human instrumentality of the Church. This new edition gives the reader a deeper appreciation for the Church which is at once the recipient and mediator of divine authority."